The content of a child could get with toy train sets in terms of education, skill and brain development is beyond imaginable. It is possible because this educational train sets are highly versatile. A good example of it would be an expansion of a train track layout. 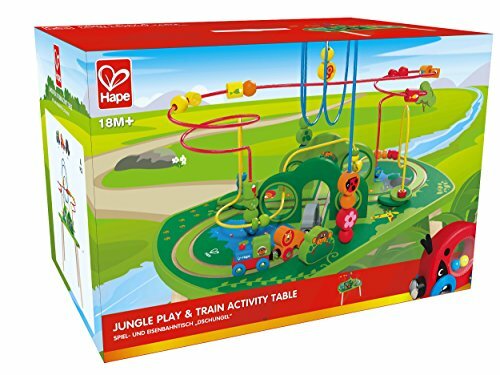 You can greatly widen the scope of the train toys route as you extend the tracks and expansion design is limited to you or your child’s imagination and creativity. But for some reason, a wooden train table limits this expansion in exchange of organization and neatness, protection, safety and security which in most cases, is more important than having a wide train track layout for your train set. Yes it’s true. 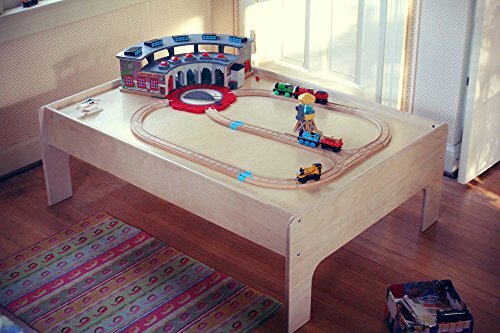 A train table will give your train set and tracks some boundaries but it could protect your kids from creating a mess and injuring themselves. A train set laid out on the floor can accidentally be stepped on by a child which could either out balance them and fall or pointed parts and accessories pinch a hole through their skin and cause them injuries or puncture wounds. 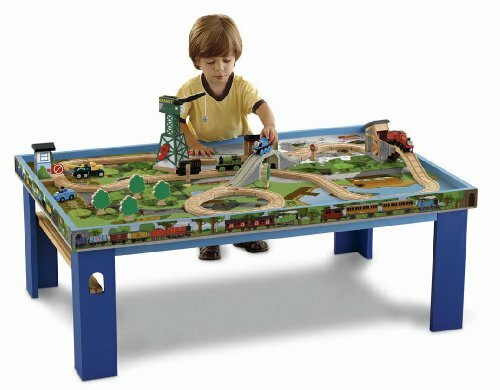 A train table elevates the train set and tracks to a position proportional to the hands and eyes of a child. It also has walls to keep all the parts and accessories on top. Another great thing about a train table is most of it are designed with curved edges to avoid any injuries. Referring to organization, train tables usually comes with a large storage bin that can fit under the table or has a built in drawer. This will keep all train things stored in one location which could greatly reduce scattering or loss of certain items. It will keep the area neat and clean. It can also be a perfect activity table if there are no train set laid on top. Your kids can work with their assignments, homework, arts, crafts and other recreational table activities. In some cases, it can also add some decorative effect in your home’s living room or bed room. Not only that it will keep your family entertained, it will provide some amusement to your home guests. Below is a long list of the best wooden train table for you and your kids. This is a wooden train set table, complete with train tracks and train accessories from Constructive Playthings. This is one of their educational toys creations. It includes a large size train table that measures to about 45 inches in length, 33 inches in width and 16 inches in height. It is perfect for children with ages 2 years and higher. The design of the table offers protection as the edges are curved with no pointy ends. It keeps all the train accessories in place on the surface of the table. 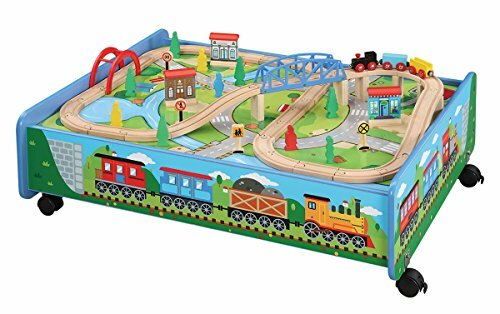 The next wooden train table set has a play board with great artistic design on the surface. 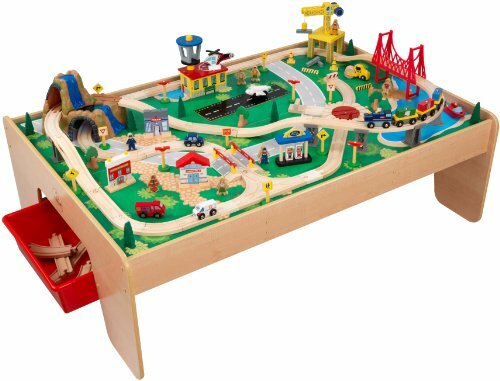 This table is from KidKraft, a known seller of train toys, sets and tables which gives most of their product, great credibility. The train table has a storage compartment, one on each side. It is built to keep your things, may it be train parts and accessories or your children’s art tools and paraphernalia. 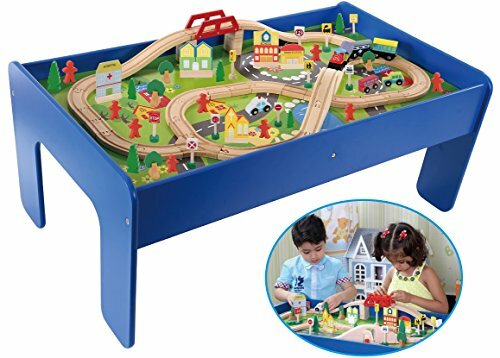 It is perfect for your wooden train track and set wherein you can easily lay them on top of the play board for an added detail. Another great product from KidKraft, this is a wooden train set with table. It features a mountain themed train set, complete with all the accessories your kids to be more imaginative and creative. The set includes wooden train tracks, train cars, other types of vehicles, buildings, bridges and a mountain tunnel. All of which can be perfectly placed on top of the train table. The train table and train set come with 3 pieces of red colored plastic bins. The table is designed with security, protection and crafted with great sturdiness. Giving you a great outlook with the product, here is a video of the wooden train set with table from KidKraft. It is right there that you will see how nicely it will give yoAur kids a proportional eye and hand level as they play with the set while being able to provide enough space for them to move. There are some people who do not prefer bins as they can accidentally cause some mess. 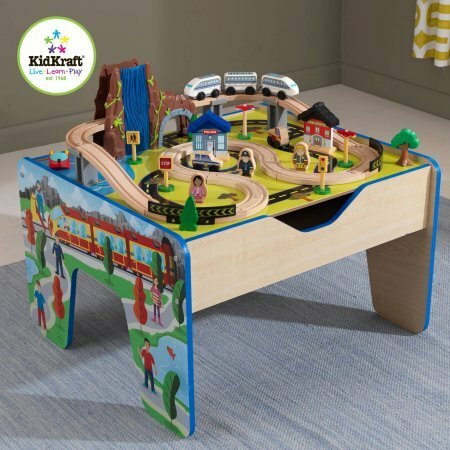 Thankfully, this wooden train table with drawers from KidKraft will provide you, not only with a train table, a train set (parts and accessories) but will also provide you with sufficient amount of storage space. There is a larger rolling trundle or storage drawer to provide a neat organization. The set comes with 100 pieces of train set and all the necessary accessories you or your children needs. We strongly believe that a short description about this amazing wooden train table with drawers is not enough to get you visualized, below is a video of how the table and train set actually looks. You would see how large it is and how spacious the table with the kid playing around it in the video. The play-board also gives the train set a nice and shiny decorative floor effect. It is obvious that most of train tables and sets are usually expensive. However, Maxim Enterprise INC made it possible for a kids wooden train table to be cheap and affordable while being able to maintain good quality that would amuse your kids for a very long time. The table has 4 strong wheels at the bottom, making it mobile. The table has some fantastic, artistic design that covers all sides. The set includes 62 wooden train pieces which are compatible with Brio train tables and set and other wooden train railway sets. 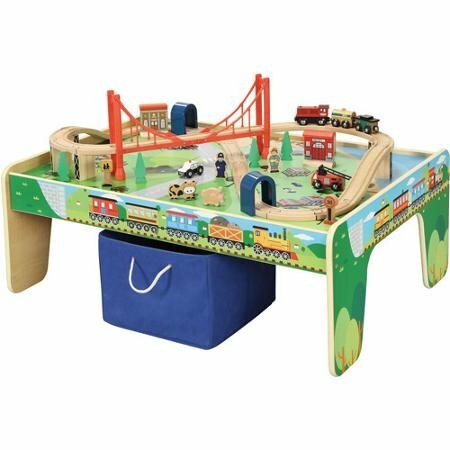 If you are still into affordable train set and wooden train activity table , then this fantastic and creative play table from Orbit is the best for you. For a low and reasonable price, the set includes a fairly sized train table that contains 90 pieces of wooden train pieces to complete your kid’s train set layout. The table provides higher walls and supper smooth, curved edges for safe and clean play. The table is strong built from wood and can withstand certain weight and pressure as your children leans unto the table. This next product is one of the best of many wooden train table sets in the market. This table is from one of the known wooden toy sellers, Fisher-Price. The table features a Thomas and Friends wooden railway set and a Thomas themed train table. It provides a playtime that extends to the wonderful Island of Sodor, a fantastic place or location in the known TV film series of Thomas and Friends. The table is very remarkable in terms of sturdiness and durability. Another cheap and affordable wooden train tables for toddlers brought to you by Imaginarium. This is fairly spacious train table with an included Thomas and Friends inspired train set. 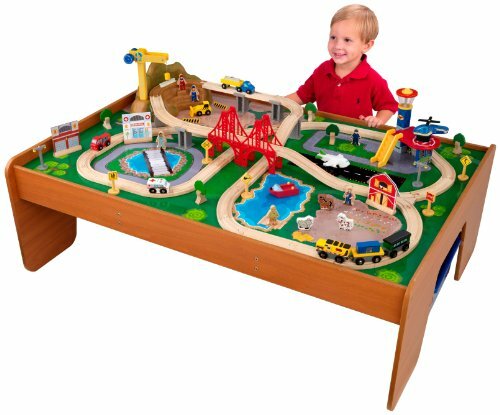 This table and train set has been discontinued by the manufacturer so it is best to grab your child a set as there are only few of this left roaming around the market. The table’s dimension measures to about 32 inches in length, 31 inches in width and 16 inches in height, a perfect measurement that levels with the arms and eyes of your kid as he or she plays. The next set is a wooden train table with storage bin. 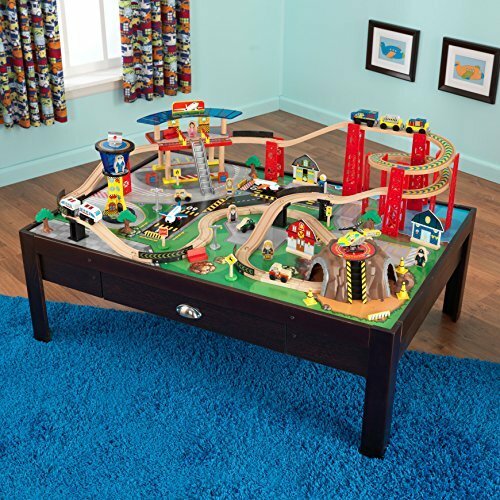 This activity table includes 50 pieces of amazing train parts and accessories made of hard, durable and real wood. It is highly compatible to connect and run with wooden Thomas the train. The train table and set requires minimal assembly effort. A small amount of adult supervision can actually be helpful as they assemble the set. 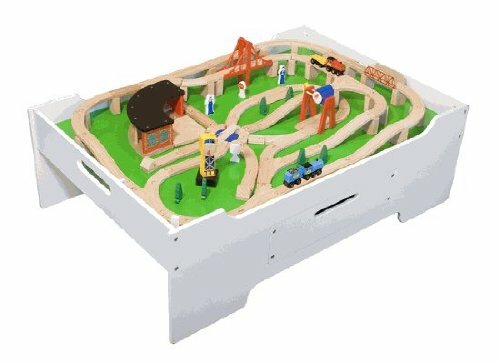 This train set and table comes with a large blue bin for storage. All this is best for children aging 3 years or higher. 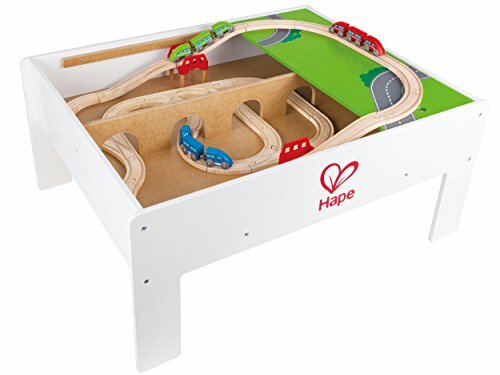 If you opt for a convenient and comfortable wooden train and table, then have a test of Hape’s Activity Table for wooden train toys. The product does not include a train toy set as seen in the picture. The reasonable price of this set comes only with a table. It is cleanly colored with white and is designed with a convertible play board on top. The play board retracts in which it can act as storage or as part of a train track design. This encourages a creative and imaginative play as well providing you a convenient storage without the use of storage bins. For those people who are a fan of a wooden train set on table, have a moment and try to take a look at this amazing activity table from Maxim. It is an affordable combo-pack set of a wooden train toy and train table. The set includes 45 pieces of amazing and long lasting wooden train pieces, accessories and parts. Each of it easily fits different brands of wooden railway sets. The table itself could accommodate other wooden and plastic train sets. It has a spacious and large measurement and comes with a large blue storage bin for free. Not like most table wooden train set, this one from KidKraft has a round or circular shape rather than being a square or rectangular table. This design provides its user with more space and movement. It can cater the needs of multiple child play as they circle around table. The table and train set include 2 curved shape storage bins that go with the shape of the table. There are a total of 80 assorted toy pieces, complete with tracks, structures and cars. 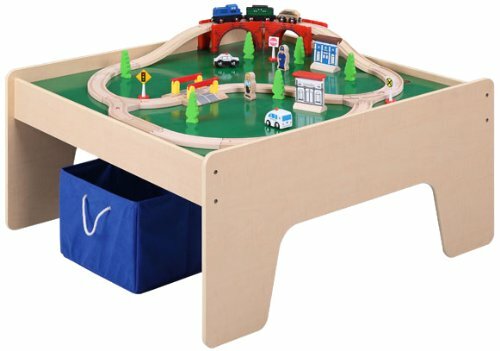 Maxim never fails to impress with their affordable bundle of wooden train tables sets. This amazing curve edged table has an average size and built with elevations to serve as protection over the train pieces on top. There are 45 pieces of train pieces included in the bundle which is very much compatible with Thomas and Friends, Chuggington and other major brands of wooden train toys. Train set requires some assembly but it highly stimulates creativity and imagination. 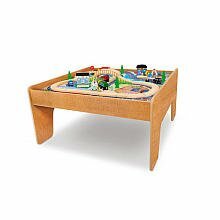 Our next wooden train table on the list is a KidKraft manufactured train set and table that features a rapid waterfall theme. The tabled is designed some details and wonderful colors. It has a built in play board on top to add some decorative effect as your child lays down his or her train set. This set and table includes 48 pieces of different parts, tracks and accessories, all for a very low price. The table is crafted with great craftsmanship skills, sturdiness which could withstand different play style of a child. Going inside the products nature, here is a very short video of how much a child could be entertained by having a wooden train table from KidKraft. You can easily slide the surface of the table and it instantly acts as a storage space to where you can keep your train stuffs. This also works as an activity table to do other things. This is a wooden train set table from Genric. The table has a large storage bin, complete with all the necessary train accessories and cars your child needs. It consists of 50 assorted pieces from bridges, wooden train tracks, train cars, policeman figures and more. The table uses curved edges to protect your kids injures in case of accidents. It also has a nice play-board drawn on top or on the surface. This is ideal for multiple child play so your child has an option to invite his friends over for a fun time. There are a limited amount of stocks left of this fantastic wooden train table set from Melissa and Doug, it is in your best interest if you grab a set now. The set is very wide and spacious. It has a thick and strong structure not only to support the weight of the train set but also the weight of several child playing and leaning on top. This table has a built-in drawer to allow you with a fast and easy storage. The table and set includes 130 pieces of train accessories including train cars, buildings, figures and more. A simple wooden train set with table with train toys designed as blocks. This is table and train toy set is preferably for toddlers. The table has 4 strong legs and a flat surface. The train cars and other accessories however, are not a usual wooden train toys that are compatible with other wooden railway sets. It actually features wooden blocks that could greatly improve logical, reasoning, identification and other skills. 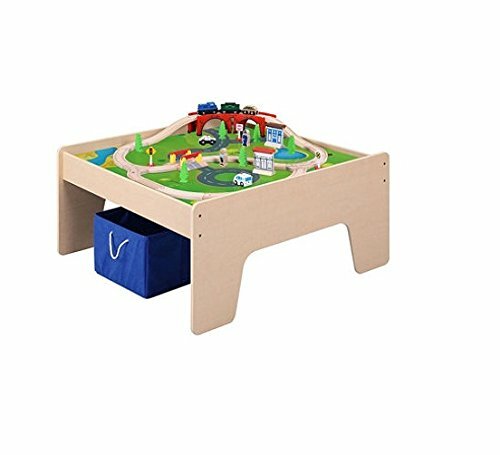 This kids wooden train table is a little bit expensive but has remarkable durability. It is built with great construction and stability. The table is made from strong birch wood, made from USA. The table also uses a safe and non-toxic furnish. Unlike any other table, each part uses a thick piece of wood and offers a very wide space for your kids to move freely around it. The table use is not only limited to train sets. It can also be used for other toys and activities such as puzzle, activity, homework or arts and crafts table. 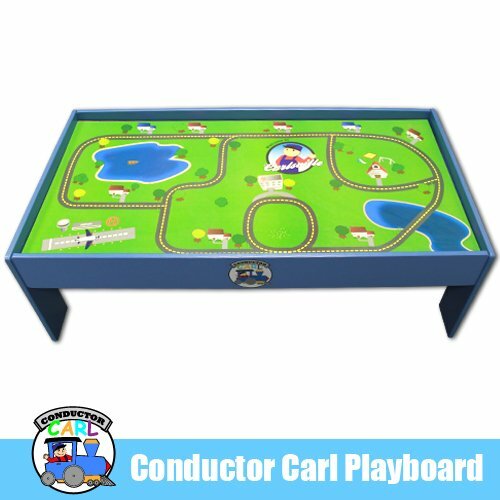 One of the many great wooden train tables for toddlers you can have is this play-table from Conductor Carl. This table complies with safety, standard and quality requirements of CPSIA which guarantees a safe and secure table product. It is built with a fun-looking play-table on top. The table is neatly colored in blue and uses thick layers of wood. It can survive rough play-style and heavy beating of a child. For a cheap and affordable table, this surely can compete in terms of quality with other expensive train tables. This is a wooden train and table from Maxim Enterprise Inc, complete with a train set and a storage bin. The train set consists of 45 wonderful train parts, cars and accessories, all the things your kids need to make their dream train design or layout come into reality. The wooden train table is versatile. It can be used as an activity table for all sorts of stuffs such as doing homework, arts, puzzles and crafts. The price is easy on the pocket and can surely serve and entertain children over a long period of time. 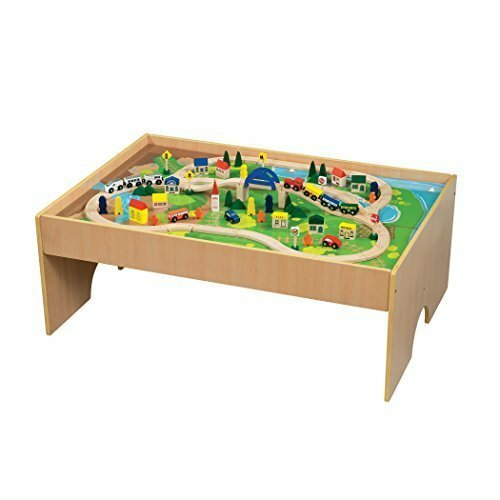 Making our way from affordable sets to an expensive wooden train tables sets, this is a large and elegant looking train table from KidKraft. The table is crafted using a combination of birch wood and plastic, making it more durable, stronger and sturdier. The table has actually been tested to carry a weight of a child standing on top. This product also features a wide storage underneath to keep your train pieces in one place. Walmart brings you a nice wooden train table with storage bin for a fair amount. 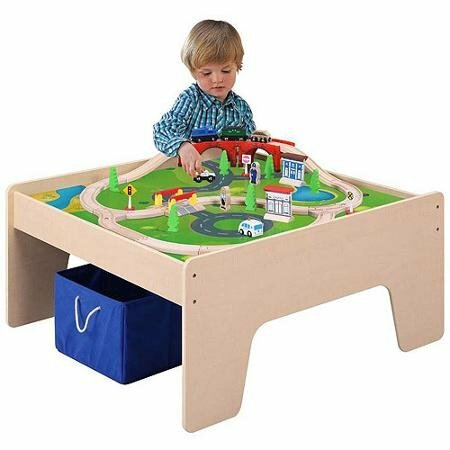 This train table is lengthy and provides children with the right amount of space to move around. It includes a nicely fitted train set that can be assembled on top, consisting of 50 pieces divided unto train tracks, train cars and other accessories. There is a nice large blue colored, storage bin included in the table set. 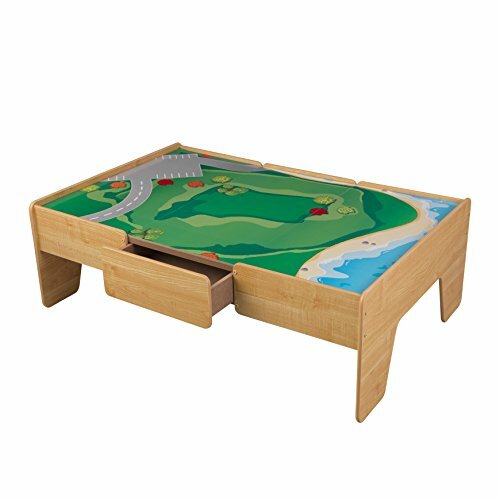 This can also be used as a table for other child recreation such as drawing, arts and crafts and more. One of the many expensive and elegant looking wooden train set table from All Aboard. There are only a few stocks left of this reliably strong wooden table for trains in the market. This table is known to have been crafted with the sturdiness that could support the weight of the toy and the weight of several children leaning around it as they play. This is a wooden train table set with a 50 pieces train set included in the package. It is actually a bundle of three consisting of a train table, a train set and a large storage bin to keep all the train cars, tracks and other accessories that completes the set. This can be bought for a very low and very reasonable amount. It is perfect for kids as it is leveled proportionally with the eye and the hand of a child. The train set included is compatible with other major brands of wooden trains. As most of you know, wooden train table set requires some assembly right after unboxing the set. Below is a short and brief video of the product from the moment you take it out of the box, to assembling and actual play. It is not a very large play-table or activity table, but for the price you paid for, the set is really catchy, convenient and reliably strong. If you are looking for a large and lengthy wooden train set with table, you need to have a look at this amazing bundle from KidKraft. 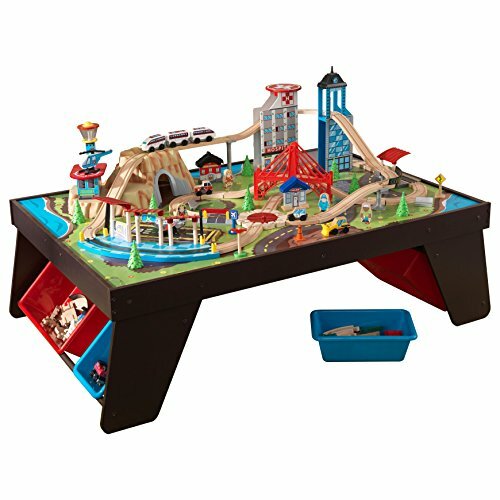 The train table includes 100 colorful train pieces consisting of decorative train accessories, bridges, figures, slides, tracks, train cars and more. The table offers a space that can allow multiple children playing all at once around the table. There is two convenient storage bins with a fair size, included in the table and train set. It is not just the product image above and the description that tells how much room this table provides. You can actually see that in the video. A mediocre priced wooden train tables for toddlers but with the highest and reliable quality from Kidkraft. It is a waterfall-mountain themed train table and set. There are 3 non-toxic, plastic made storage bins included. The table uses T-mold edges to keep your children safe from injuries during accidents such as bumps, falls or as they play roughly around the table. There is also a large number of pieces consisting of different train parts and accessories included in the set. 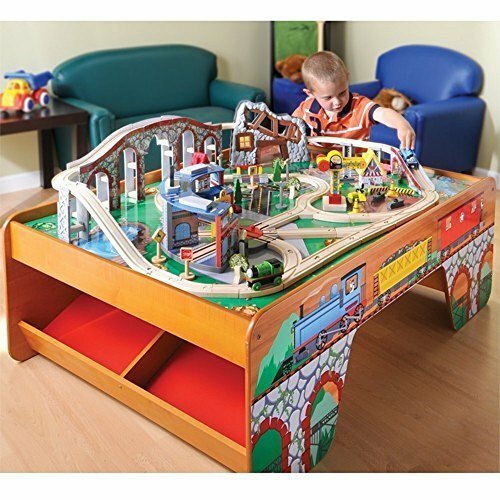 This is the Metropolis wooden train table with drawers. The manufacturer is giving their customer two variety of colors to choose from. You can choose to purchase this lovely set with a honey color or a nice wood finish. Of course, price varies depending on what color or type you chose. 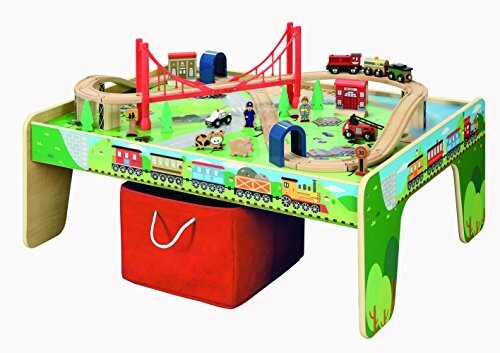 The table comes with wooden train toy parts and accessories that totals to about 100 pieces, including a two tiered bridge, mountain tunnels, figures, cars and more. Lastly, a KidKraft wooden train and table that suit your kids train needs. It is made from a combination of plastic and solid wood. The table comes with 85 train accessories consisting of tracks, cars and all the other stuff to enable you to have a complete train set layout. 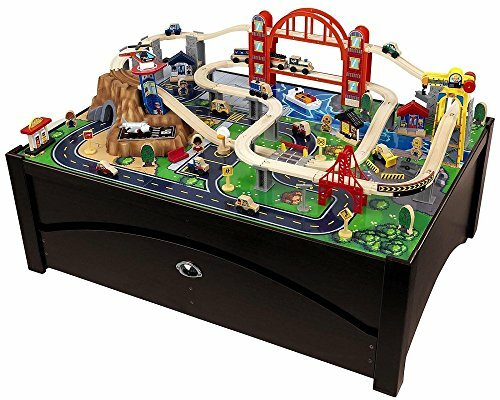 The set is complete with entertaining features such as winding tracks, molded mountain bridge and tunnel, helipad, hospital and more. It also does come with a storage bin to keep your train things organized, all for a great and reasonable price.